Get Amazon Prime Membership @ ₹249. Last Chance to grab Amazon Prime Membership @ Best Price. This offer ("Offer") is made available to you on www.amazon.in and its corresponding mobile site and mobile application (collectively, "Amazon.in") by Amazon Seller Services Private Limited ("Amazon"). These offer terms and conditions ("Offer Terms") are in addition to the Amazon.in Conditions of Use & Sale and Privacy Notice to which you agree by using Amazon.in. In the event of any conflict between the Amazon.in Conditions of Use & Sale and these Offer Terms; these Offer Terms will prevail, with respect to this Offer only. This Offer is valid from September 25, 2017, to October 31, 2017 (both dates inclusive) ("Offer Period"), unless revoked or extended by Amazon in its sole discretion without any prior notice and without liability. Will be entitled to receive Amazon Pay Balance worth INR 250 in his/her Amazon.in the account. 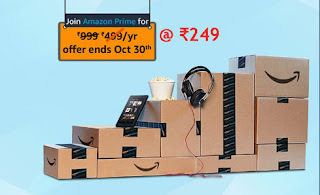 In the event a customer has previously availed the free trial of Amazon Prime but did not subscribe to Amazon Prime, he/ she may, during the Offer Period, visit the aforementioned link, subscribe to Amazon Prime using Amazon Gift Card, stream any Amazon Prime video content, and become entitled to receive Amazon Pay Balance worth INR 250 in his/her Amazon.in the account. Amazon Pay Balance is a sum of all balances associated with Amazon Gift Cards in your Amazon.in account. Amazon Gift Cards are issued Qwikcilver Solutions Private Limited and are subject to the Amazon Gift Card Terms and Conditions available at https://www.amazon.in/gp/help/customer/display.html?nodeId=202123460. Customers who had previously subscribed to Amazon Prime but canceled the subscription or failed to renew the subscription will also be entitled to avail this Offer provided that such customers, during the Offer Period, visit the aforementioned link, renew their subscription using Amazon Gift Card, and stream any Amazon Prime video content. For the avoidance of doubt, this Offer can only be availed if the payment for Amazon Prime is made by Amazon Gift Cards. If the customers make the payment using any other payment method, such customers will not be entitled to avail the Offer. Also, customers will not be entitled to avail this Offer if such customers subscribe to Amazon Prime in any manner other than visiting the link mentioned above. The Amazon Pay Balance will be credited to eligible customer’s Amazon.in the account within 45 days from the day on which the customer streams the Amazon Prime video content. This Offer can be availed by a customer only once during the Offer Period. In the event any customer fails to meet any of the above-stated eligibility criteria or any term under these Offer Terms, he/she will not be eligible to receive the Amazon Pay Balance under this Offer. By participating in this Offer, every customer expressly agrees that Amazon or any of its affiliates will not be liable or responsible for any loss or damage whatsoever that a customer may suffer, directly or indirectly, in connection with this Offer. Any queries in relation to the Offer should be addressed directly to the customer support at https://www.amazon.in/gp/help/customer/contact-us. Amazon reserves the absolute right, at any time, without prior notice to withdraw and/ or add/alter/modify/change or vary all or any of these Offer Terms or to replace, wholly or in part, this Offer by another offer, whether similar to this Offer or not. No person is bound in any way to participate in this Offer. Any participation is voluntary and the Offer is being made purely on a best effort basis. These Offer Terms are governed by the laws of India. Any dispute arising out of or in connection with the Offer will be subject to the exclusive jurisdiction of the courts at New Delhi.